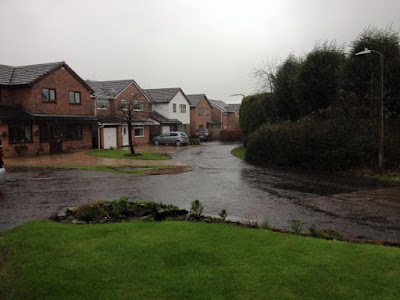 I have now started part 3 of our UK winter escape by flying back to Spain, and our motorhome which we left in the safe care of friends who spend their whole winter here. 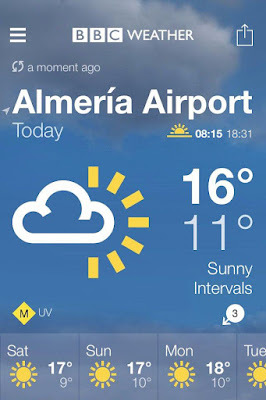 I flew in alone, yesterday courtesy of Monarch Airlines who have conveniently maintained their direct flights from Manchester to Almeria all through the winter months this year. The flight departed Manchester at 6.25am, and I was making myself a cuppa, back on site by 10.30am. This flight was a little more expensive than our December one home, at £53, but that included my extra legroom choice of seat at extra cost. I had no check in hold luggage, which would also have been extra. Margaret has pre-arranged child minding duties, at our son and daughter-in-law's home, so will join me here in three weeks time. The weather was a little different to that I left at Manchester, today has been superb. 19 degrees and fine sunshine. The forecast is also set fair for the foreseeable future here. My friends here tell me that they haven't really seen any significant rain all the time we have been away. I am now back in T shirt and shorts. So, bright and early this morning (not in shorts I might add) I decided I would do a bit of a solo sight seeing tour on the bike, something Margaret never fancied, as the roads are steep and mountainous coastal routes, and she dislikes being a pillion passenger at the best of times. I intend to hire a car for four weeks from just before Margaret arrives back, so I can collect her from the airport. Car hire is so cheap here during the winter months, and I have been told by friends here that one particular well known company, Gold Car, has provided them with a car for the whole month of February at a negotiated weekly deal rate that equates to not much more than my one way taxi fare from the airport to here yesterday. However I intend to stick with the company who is linked with the camp site for convenience, Kisacar. They will also deliver and collect the car to and from here. My first call today was to the village of Cabo de Gata, (which holds a farmer's market every Saturday) before heading off up the coast road, first to Rodalquilar where there is an interesting (to me anyway) abandoned gold mine together with a brilliant visitor centre which describes its history. There is also a completely abandoned, and now derelict village here, that used to house the mine's workforce. When it closed, there was nothing left in the area for them, so they left en-mass. I then continued on to the coastal village of Las Negras, before coming back to explore San Jose once again, a small coastal village which we love. All of this is contained within the Cabo de Gata Nijar Parc Natural, and as far as I am concerned, even with the desert landscape, is one of the best (undiscovered) places in Spain. A brilliant start to the next two months we have here before motoring back to the UK via Santander and Portsmouth. I Would Never Go On A Cruise - It's Boring! How many times have we heard that! We also hear this from those who have never ventured out of Europe, "we wouldn't like the days at sea in between ports", or "what use is there in just having one day in a place and then having to move on?" Or "we don't like dressing up." Well, we like dressing up, it is part of the ambience of what you are doing, and for us wouldn't be the same without it. Arriving to dinner in blue jeans and a polo shirt might be OK for some mainland hotel or campsite restaurant, - and we do that, but it would certainly be way out of place here - although there are cruises available where you can do that if that's what you want. All these are statements from the un-initiated! Cruising, particularly in the current market is by far the easiest and cheapest way of seeing the world. Once you are safely aboard there is no more thinking to do, no more flight connections to worry about, and no more hotel rooms to check-in to - just one luxury hotel on water, waking up in a different location to explore, and then having the security and safety of being able to return to the ship afterwards, ready to move on while enjoying dinner. What's not to enjoy? How else would you ever visit exotic locations such as Tahiti and Bora Bora? And all this can be done for an average price of around £100 per person per day, with many last minute deals always available that take that down to around just £50 per person per day, and often with flights to or from the ship as well as hotel accommodation before or afterwards thrown in at the headline price. There is however just one caveat here, and that is the 75% supplement charged to single passengers, although I have seen promotional offers where this charge has been waived. On board ship there is always a full itinerary of activities to either follow in full, in part, or not at all. The choice is yours. There are quizzes, bridge lessons, shows, bands, lectures, music recitals, art classes, dance classes, dancing, you name it you can do it, and for no extra cost. Then add in all that food from several restaurant choices, again included....well, enough said. This is how you know what is available to do on a daily basis...... delivered to your room by your steward during the previous evening. Inside is an hour by hour timetable of the next day's events. Ships are usually equipped with a full size theatre complete with a live orchestra to back up entertainers who are brought aboard, or the resident singers and dancers who put on spectacular West End style stage shows. These were a trio brought on at New York for a one night stand during our recent voyage. Then, during the day you can either participate in outdoor pursuits, or just relax in one of the lounges, perhaps with a quiet drink. 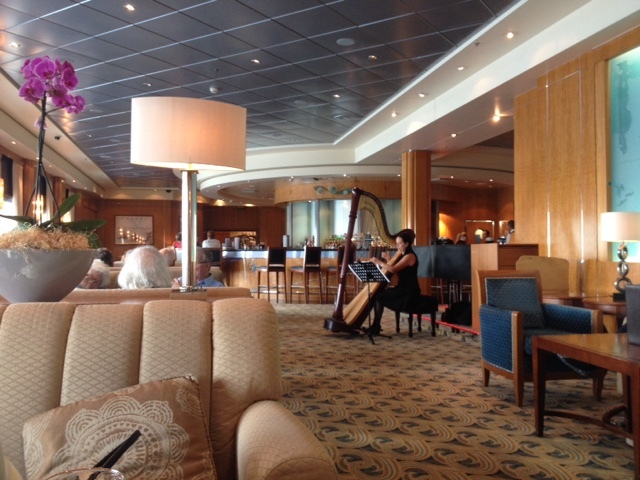 This is the Chart Room Lounge on Queen Mary 2, where a harpist would provide background music during the afternoons. There are many bargain deals to be had, some including flights and hotels in the price you see. Why not give it a try. Our first cruise was back in 2010, with 6 weeks aboard to Australia, arriving there without the usual jet lag, relaxed and fresh, and we haven't stopped since. QM2 Testing Her Horns At Sea. Throughout any voyage on a large ship, routine testing and drills will take place. 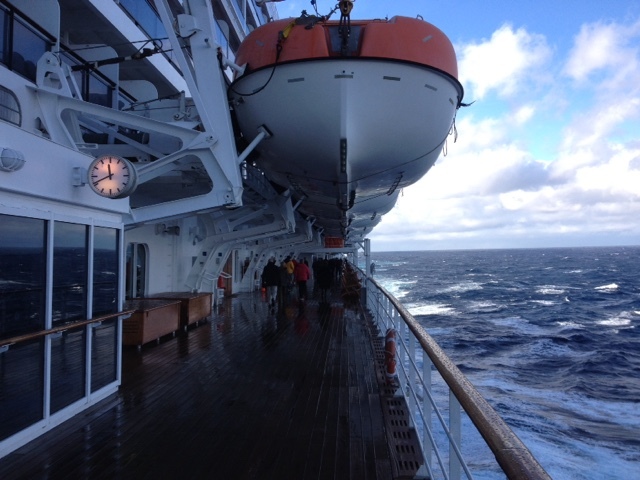 While crossing the Atlantic on Queen Mary 2 this month the crew spent a whole morning to practice putting out a potential fire in the emergency generator room, and another practicing the launching the rescue rib procedure in the event of a "man overboard" call. This is footage of the testing of her horns. 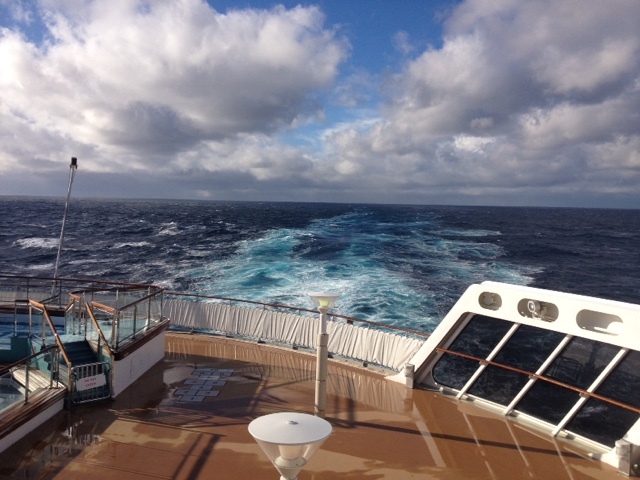 taken from starboard side deck 7 - her promenade deck. 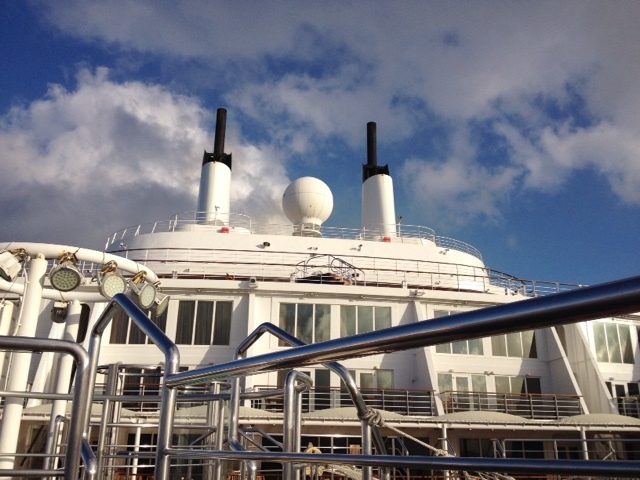 One of those horns is an original, taken from the first Queen Mary, and mounted on her modern counterpart. My guess is that this is the deep noted one. The Yamaha ec-o3 3 Years On. 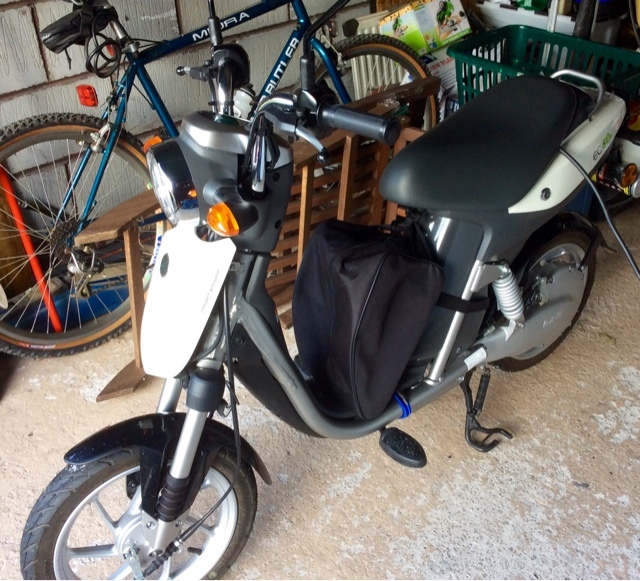 Our little Yamaha ec-o3 all electric scooter will be 3 years old in February, and as such will need the attention of the MOT tester. Being classed as a 50cc petrol moped, the bike has to be registered, taxed, insured and MOT'd (on its third anniversary from first registration - UK regulations). During my ownership I have discovered that it isn't the easiest two wheeler I have owned to insure. The first hurdles are actually finding a bike insurer who will take it on at all, and once one of those has been found, it is by no means cheap. I have consistently owned motorbikes of all sizes throughout my life, since I was 16. As well as the ec-o3 I currently own a Yamaha D'elight scooter, also to use in conjunction with the motorhome. Before this my bike was a Suzuki 1200cc Bandit, and before that a Yamaha 1000cc R1. My point is that I am an experienced motorcyclist. However, my cheapest quote to insure the ec-o3 during the present year was £79 for third party only cover - not even cover for theft. And that is for a machine that travels no faster than a pedal cycle! Due to these complications I have to insure the ec-o3 independently from my other bikes. The road tax however is free, but before this can be renewed, the MOT test had to be completed. This was done today without issue at the standard fee for motorcycles - £25. It may be a so called Eco vehicle, and is handy to use with the motorhome, but owning it doesn't come without complications. The reliability has been first class though, in particularly the battery, which still functions quite normally after 3 years (limited) use. For anybody considering one of these, with hindsight I would probably take a long look at one of the premium brand electric pedal cycles before making my decision to buy in this sector of the market. This Surely Is The Only Way To Travel! We are now back in the UK after an exhausting but fantastic adventure over the last twelve days which took us to Las Vegas for the New Year's Eve celebrations, and then on to New York City for a few days city exploration and shopping during the first days of the new year. These are both places we have not visited before, and were on our wish list. 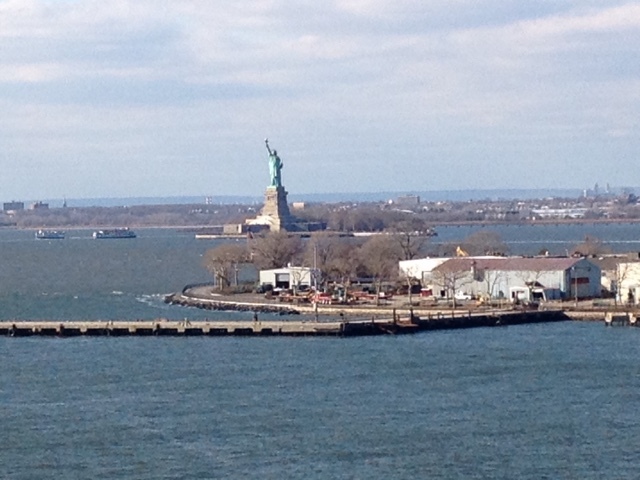 The view from QM2 while docked in Brooklyn. 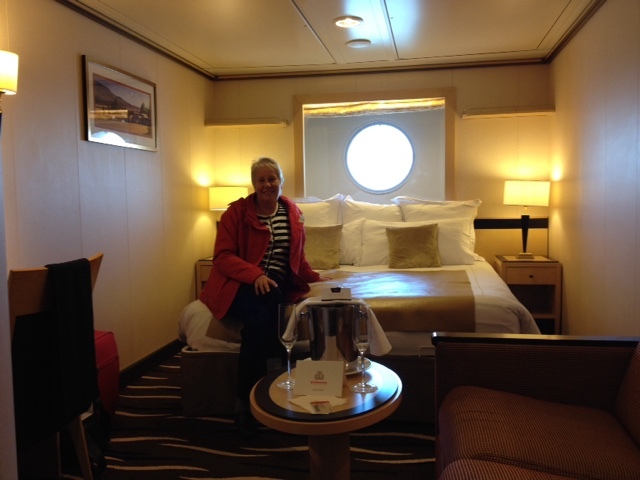 For our return journey back to the UK we had passage booked on Cunard's flagship, Queen Mary 2. We were collected from our Manhattan hotel by limousine at 11.00am on Sunday morning, the 3rd of January. Cosseted in the plush leather interior complete with complementary drinks, our chauffeur whisked us off through town towards Brooklyn, and the docks where we caught our first glimpse of where we were to spend the next 7 nights on our way home. This was much more appealing than another long haul flight. The view as we arrived by limousine. The check-in hall at Brooklyn. Our driver passed our luggage into the care of the dock porters and we entered the Cunard check-in hall, for what turned out to be a quick and efficient process, and we were aboard ship and installed into our art deco style stateroom by midday where we found a welcoming bottle of bubbly waiting for us with the Captain's compliments. As always, luggage is brought to the room by porters later, so after drinking up off we went to explore our surroundings for the next week, and to have lunch in the Kings Court buffet located on deck 7, just one deck up from our own accommodation on deck 6, room 6017, towards the bow, and staircase B. We were allocated an outside cabin for this voyage on the starboard (right) side, which as it happened, complied with the old way of crossing the Atlantic for UK travellers - Port side Out - Starboard side Home, where the term POSH originated, as the sun would always be in the cabin throughout each day, and so were designated as the best cabins to have. 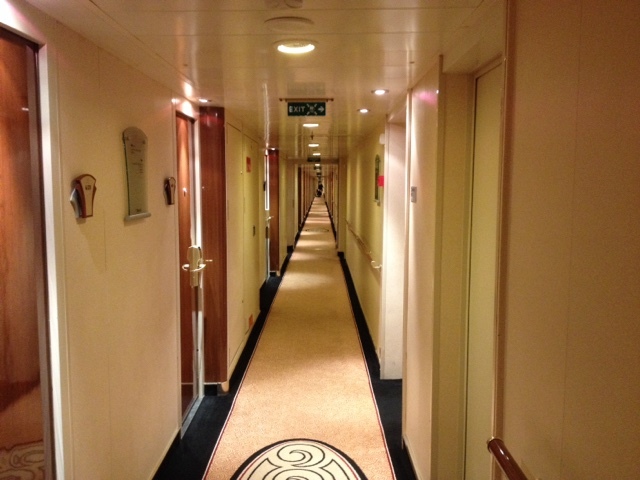 Deck 6 accommodation corridor. This is a BIG ship! 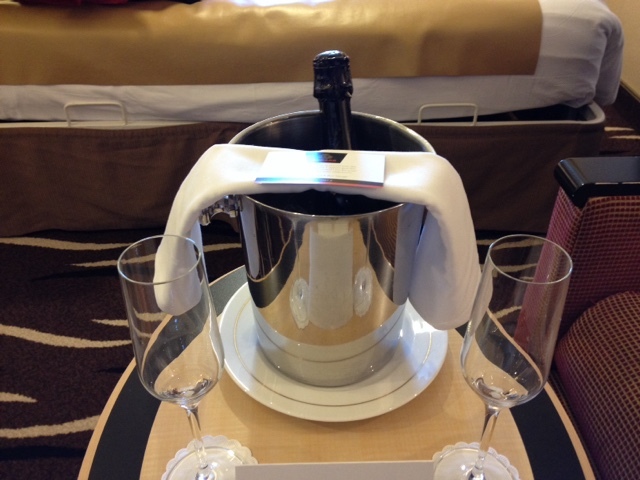 A complementary half bottle of bubbly waiting in our room on arrival. 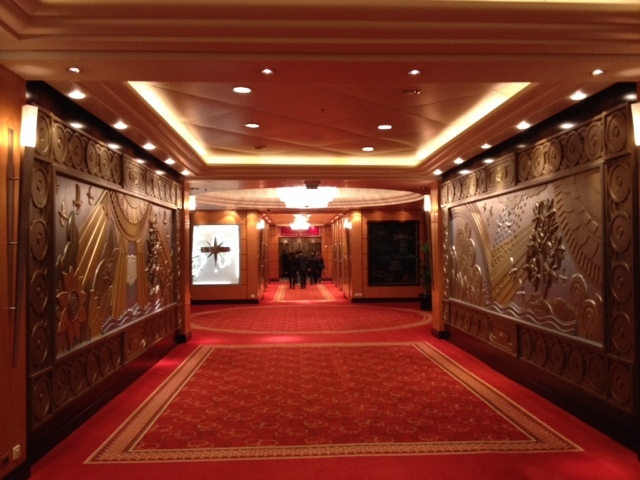 I can confirm that this ship, the flagship of Cunard's fleet is fab-U-lous! The interior decor is just amazing, with luxurious thick pile carpets and world class sculptures everywhere. QM2 is also a passage maker, not a cruise ship. She was designed and built specifically for crossing the Atlantic Ocean, and to replace her predecessor, QE2 in 2004. As such she coped amazingly well with the huge seas that can be encountered on this voyage, and we hardly noticed any movement throughout our time aboard, although we did have relatively good weather with several sunny days mid-Atlantic, and just a couple of days gale force winds up to force 10. 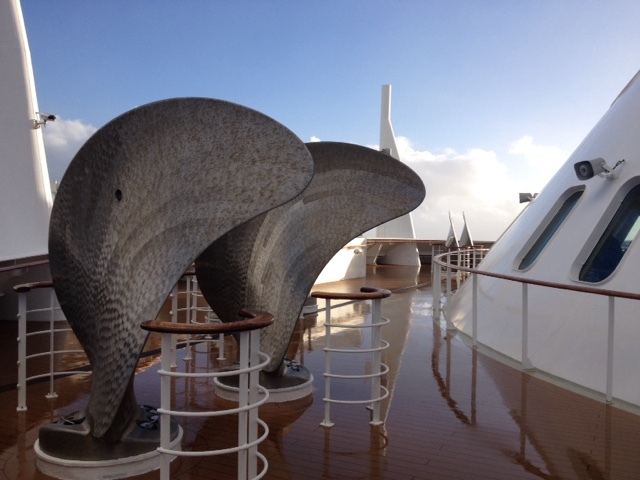 These are not deck sculptures, but spare propellor blades carried on the fore deck. The promenade deck is clad in solid teak. 3 times around is 1 mile. 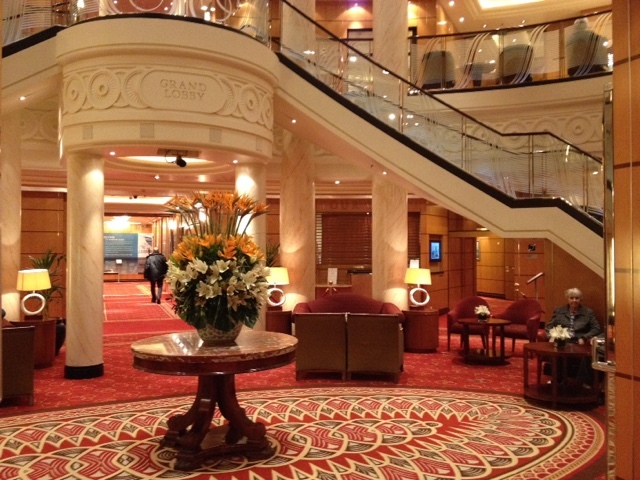 Cunard operate a tiered system for their passengers, depending on how much you would prefer to pay for your voyage. Some would describe this still as a "class" system, but I can assure those who may be concerned about this that is is not noticeable at all, and the bulk of the passengers travelled just as they would on any other modern cruise ship. 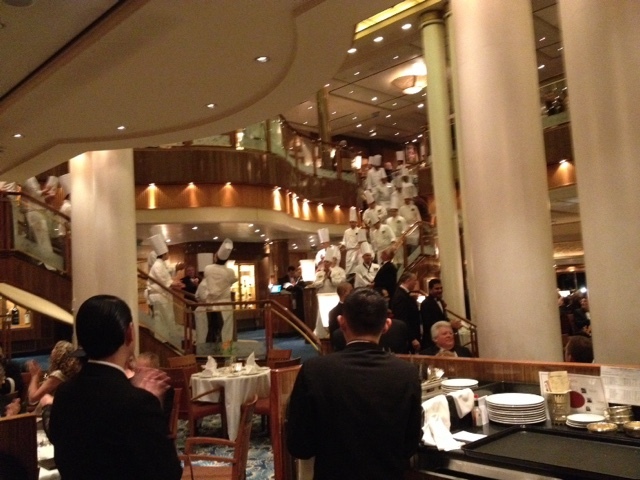 Those wishing to pay the (hugely expensive) charges to have one of the ship's luxury suites, are also given the opportunity to dine in their own designated restaurants, where everybody else is excluded. They also have exclusive use of one of the stern tiered decks. However, as any other passenger, this went completely unnoticed by us, and was of no concern at all. In fact we had a single lady on our own table within the Britannia restaurant, who was residing in a suite, and as such had the opportunity to dine in the restaurant associated with her accommodation. However, she preferred to be with us as she claimed the atmosphere within the Princess Grill restaurant was a little subdued for her, and preferred a more lively, chatty dinner. Chocoholics is an event not to be missed. Kings Court Buffet seating area. 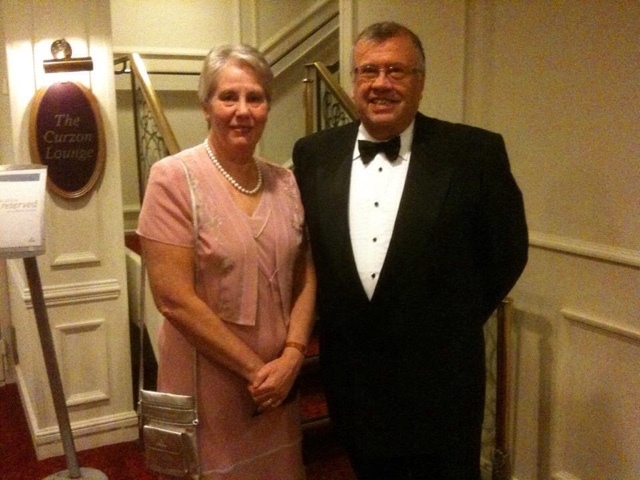 We have been on several previous cruises, all with P&O Cruises, but had started to notice what we perceived as a steady decline in standards, due to what we believe was the need to cut fares just to fill the ships. Over the years many small, but significant little things have been withdrawn from P&O's offering. In our own experience this has been things like premium menu items such a fillet steak, lobster, crepe suzette, baked Alaska with flambé cherries, and so on. 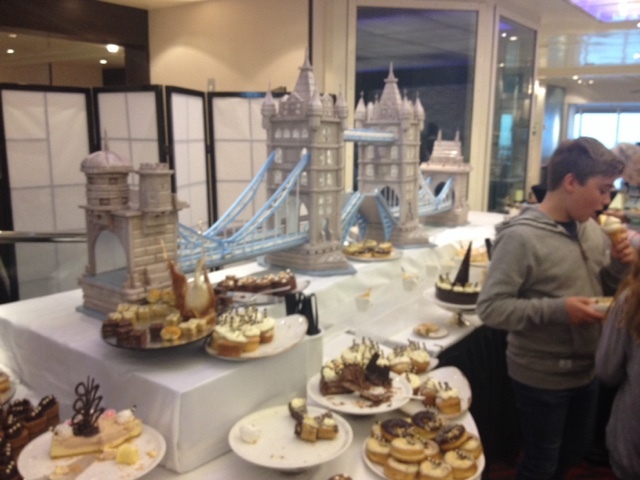 All these dishes remained part of our Britannia restaurant menu during our voyage. Other benefits included all day complementary juices and lemonade in addition to the usual free tea and coffee as well as self serve soft ice cream within the buffet restaurant. 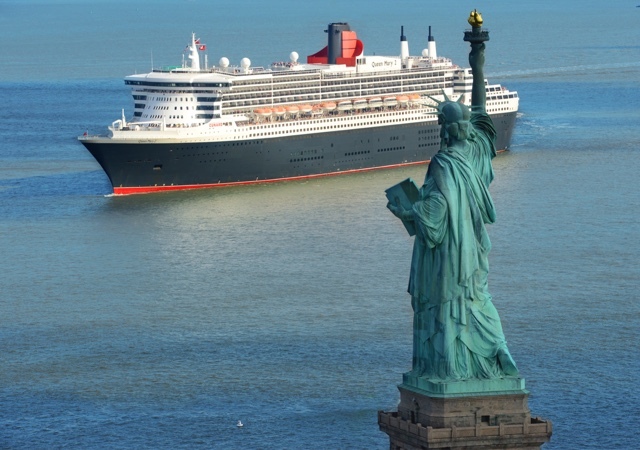 Cunard's offering remains excellent value for money and extreme high quality. 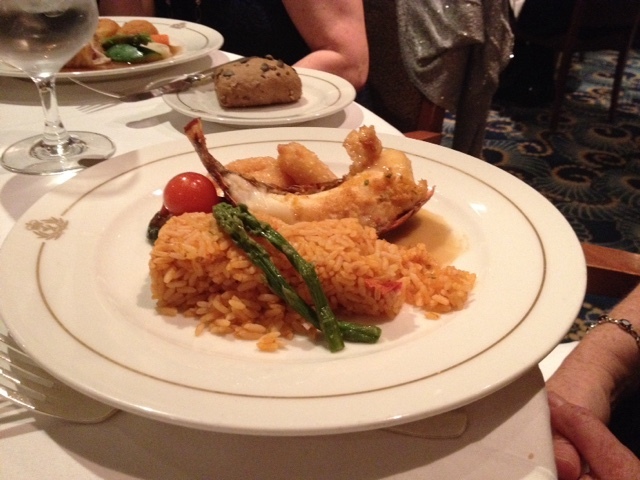 A lobster dish served in the Britannia Restaurant. 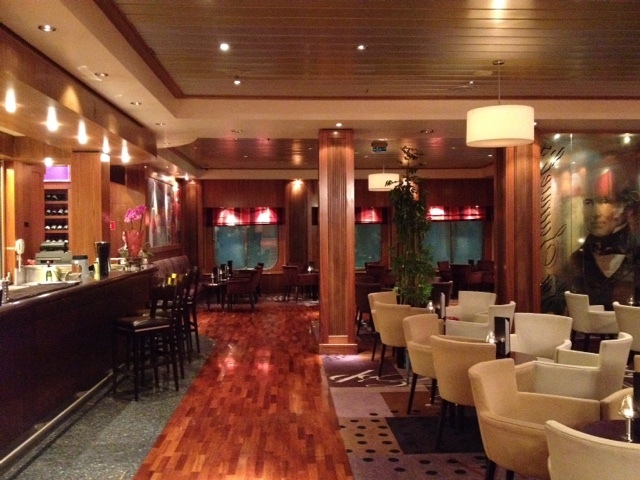 Dinner is served in the Britannia restaurant for all passengers except those in suites. This is on two levels, accessed from decks 2 and 3. There are two sittings, 6.00pm and 8.30pm. We chose late sitting, and were allocated a table for 6 on table 90, located on deck 2. For those on longer voyages, this enables you to enjoy full days ashore on port days, as well as indulge in afternoon tea without feeling too "stuffed"! A choice can then be made about other meals. The deck 7 Kings Court buffet serves breakfast, lunch, afternoon tea and dinner on a self service basis and inclusive within the price or your fare. The buffet is split in the evening to provide room for an intimate restaurant experience providing alternating Asian, Indian or Italian cuisine during the evening at an additional cost of $15 per person. Alternatively you can choose to have the silver service breakfast and lunch within the Britannia restaurant at no additional cost. 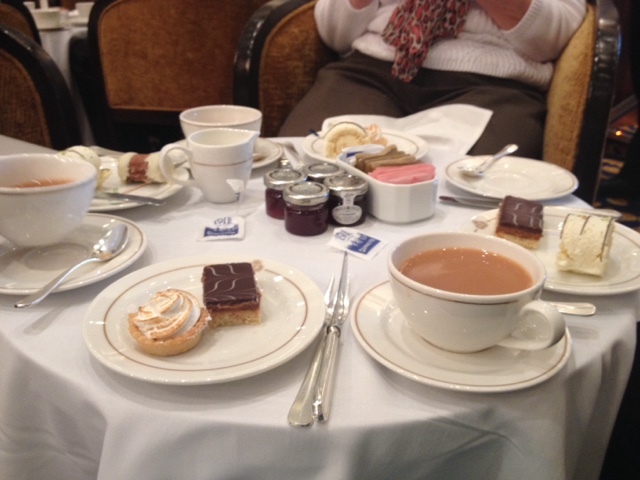 Silver service afternoon tea is also available in the Queens Room, also at no additional cost. 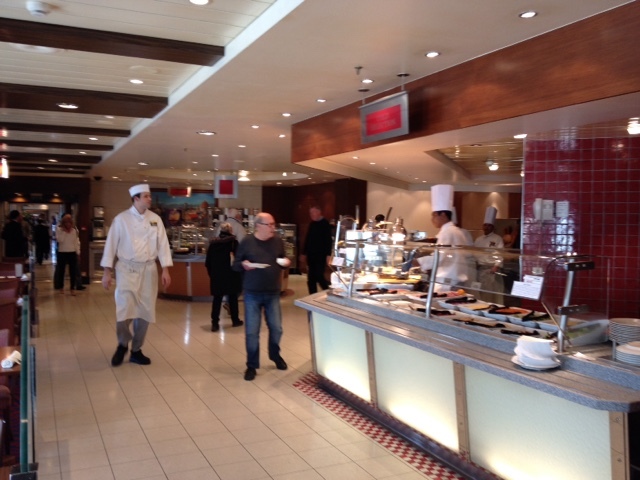 Finally, daytime free snacks are available in the Sir Samuel's lounge, as are bar snacks, consisting of pie n mash, fish n chips, cottage pie, or ploughman's lunch, in the Golden Lion Pub, located on deck 2. Add to this the availability of food up until 2.00am, and you could, if you wish, eat all day long! Afternoon tea in the Queens Room with a string quartet to entertain. Petite sandwiches, fancy cakes and warm, freshly made scones with cream and jam. 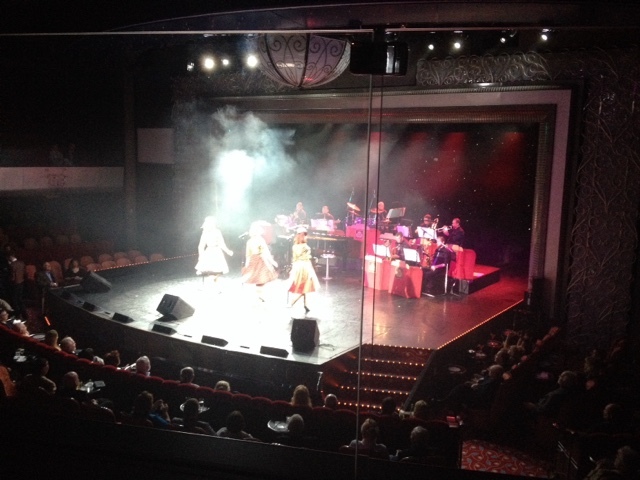 The Spinettes entertain in the Royal Court Theatre. A harpist adds background music in the Chart Room during the day. Entertainment is also in abundance. There are numerous quizzes throughout the day and evening. There were several New York Times journalists aboard who gave daytime lectures on various subjects. A harpist played in the Chart Room lounge during the day, and various pianist played in the lounges and pub at various times as background music. A string quartet accompanied the Queens Room afternoon tea, and there are two full orchestras aboard who play in the theatre and the Queens Room during the evenings. 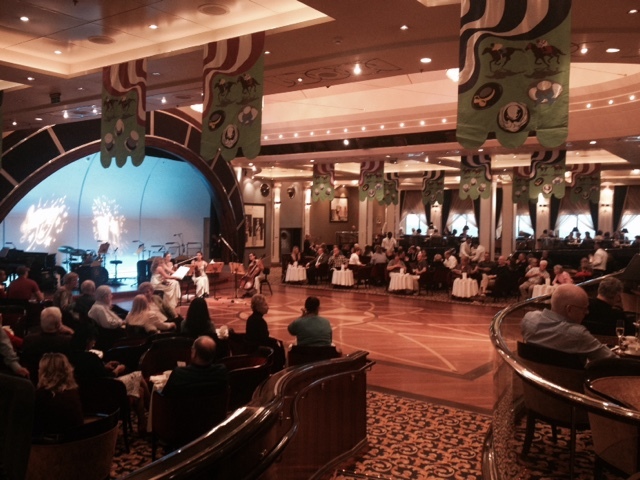 A jazz band also played in the Chart Room lounge during the evening. There is also a night club and disco aboard. The theatre hosted acts brought aboard to entertain, and on other evenings spectacular West End style shows were put on by the resident Royal Cunard singers and dancers. One of the excellent shows by independent performers was by the Spinettes, a trio of girls who sang vintage wartime songs from the Andrews Sisters etc. 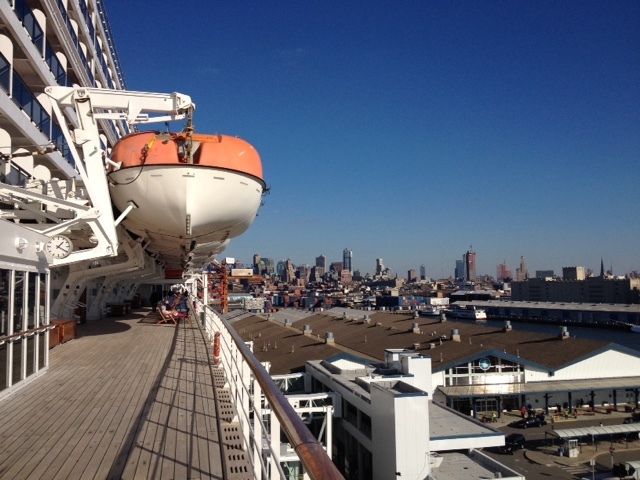 The voyage home on Queen Mary 2 was most definitely the highlight of this holiday to the USA. 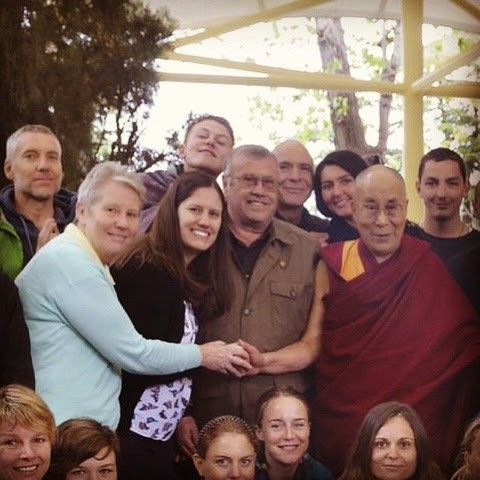 We booked this through http://www.iglucruise.com a company we have successfully used previously. We like them because they provide competitively priced cruises that include all the extras that may be required, such as hotels and flights, within their headline price. This one consisted of our flight from Manchester to Las Vegas, a transfer from the airport to the Luxor Hotel and Casino, where we enjoyed 3 night's stay, a transfer back to the airport, for a flight back to New York. 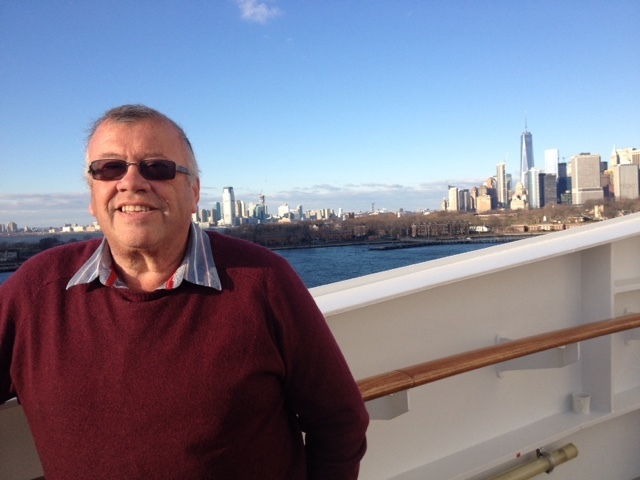 Another transfer from Newark to New York City, and the Holiday Inn for a further two night stay, and then our limousine from there to the ship, where we enjoyed a further 7 nights aboard for our journey home. All this was just £1600 per person all in, although there were additional resort taxes to pay in Las Vegas, as well as a hold luggage charge on the return internal flight to Newark. There are also gratuities to pay on board QM2, currently set at at $11.50 per person per day, although we know of several packages that now include this charge within the headline price. Is that not extreme value for money? We think it was. A Queen Takes Us Home. I had scheduled a post to publish tomorrow using library images from our daughter's last trip to New York, but I now find I have the time to post the real thing......so. Just a brief post while I can still use my £10 per month 5gb internet allowance from Three in the UK, which is available here in the USA at no additional cost. ( I also used it all through Spain in October / November, also within my £10 monthly UK allowance, a great asset to any traveller). 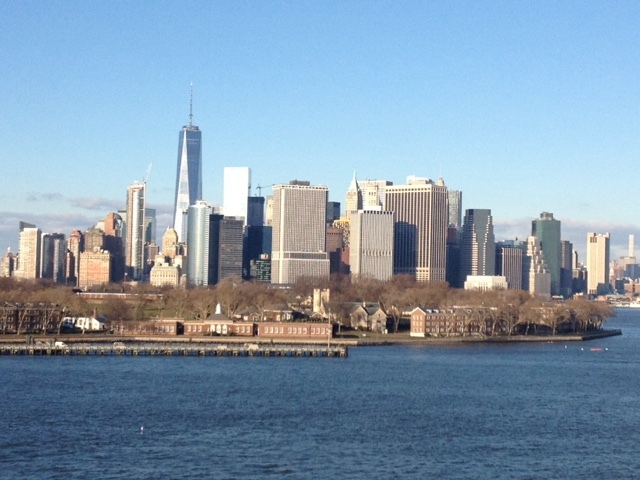 We are now in Brooklyn and have boarded our transport back to England, where we are due to arrive on 10th January. 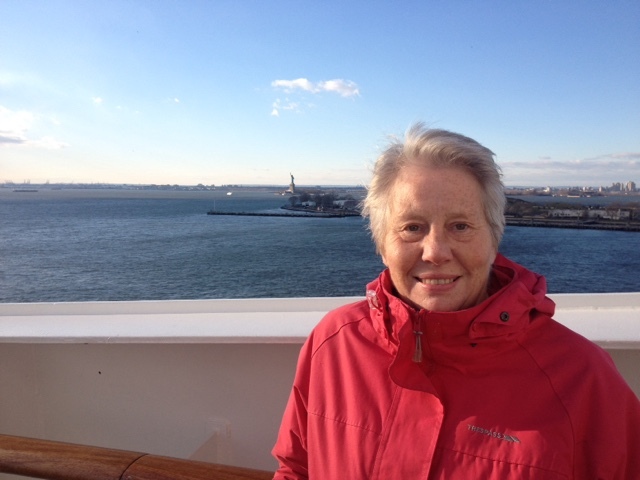 We are on Queen Mary 2, and today's weather is fabulous. Just a few images from around the ship for now, I will report in full once back in the UK. 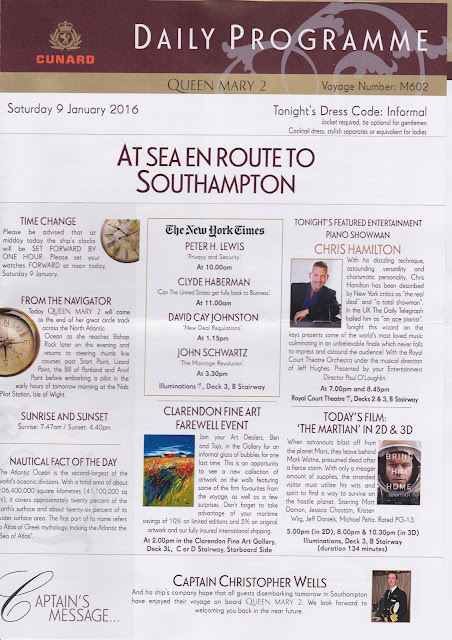 And from our last world cruise.....We have four such events on this voyage.